Greetings Judges! 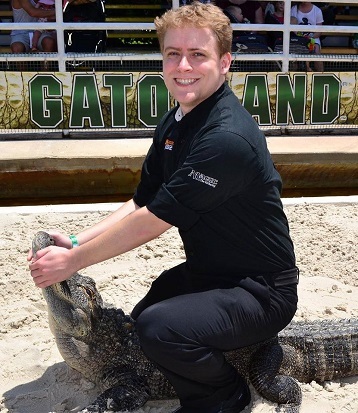 This week we’re featuring David Greene, an L2 from the great state of Florida (look for the alligator riding photos), who works on the project you may have heard of, “Judge’s Corner“. Judge’s Corner produces YouTube videos for rules and policy knowledge to share! Why did you become a judge? I became a judge because I was the local rules guy who everyone turned to with their questions. Favourite card: Spiritmonger, the face of my first deck. Favourite format: Anything constructed. I’ve been losing a lot at Tiny Leaders recently. Commander General: Currently Olivia Voldaren, but I’ve been looking to reformat Omnath, Locus of Mana into something with black and green in it. Maybe Sidisi. Best tournament result: 34th place at the last Magic Scholarship Series Nationals in 2007. I actually changed my deck the night before the event, and used my friends’ lists instead with a personalized sideboard. Random fact about yourself: I was a level 2 Yu-Gi-Oh judge back when their judges had levels. I went through an entire year playing the clarinet in middle school without ever learning how to read sheet music. How did you get involved in magic in the first place? I played Yu-Gi-Oh in grade 6 because my friends got me into it. This brought me to a local game store, where I found Magic, and eventually I picked up the game. The rest is history. It has matured me. Being thrust into a role of responsibility will do that to a person, and honestly it was a great direction for my life. It’s nice to see how motivated to learn and teach I’ve become thanks to the judge program, and the people in it. It also has brought a lot of wonderful people into my life. I don’t get to play Magic as often as I’d like, and I get to judge even less. Fortunately there is a lot you can do as a judge aside from judging events. This keeps me in touch with Magic, and lets me continue to enjoy the game without necessarily enjoying the game play. Listen to many, speak to few. The best part about my local Magic community is how open and accepting we all are. People have their differences, but the players are generally very friendly, competitive, and helpful across multiple stores. What is your favourite non-magic hobby? Board games. I never thought I would like so many different board games. Ticket to Ride is one of my most recent favorites. Back when I was about 16, I carpooled with a friend and his friends to a PTQ a couple of hours away. I didn’t do too well, but had a lot of fun while I watched one of our companions actually top 8. I learned later that he had actually been to the pro tour a couple of times, and he ended up winning the whole thing. We celebrated by going out to a local restaurant to eat. Lots of laughs, good food, and few hours later we’re heading home. On the way home it turns out the pro player had a little too much to drink, but you wouldn’t have known it by talking to him. He seemed to have his wits about him, and kept composure, but politely urged us to pull over. After a quick exchange to assess how serious the matter was, we pulled over on the side of some interstate highway, in middle of nowhere at about one in the morning. The player proceeded to calmly exit the vehicle, throw up all over the ground, and then disappear into the woods for about 15 minutes. The designated driver and I speculated that a bear had eaten him. He returned, we asked where he had gone, and he replied “into the woods”. Grand Prix Charleston. It was my first GP ever, the furthest I’ve ever traveled to judge an event, and the most over staffed event with one of the lowest player turnouts at the time. I learned a ton, experienced many aspects of multiple teams, and interacted with a bunch of judges. It was a great opportunity to learn a lot. I’ve actually contemplated this before, like “what if a weeping angel transported me to 1914” or “what if the zombie apocalypse occurred?” I’d probably be too preoccupied with World War 1 or the undead to think much of Magic, but I’d like to think that if Magic spontaneously ended I’d try to recreate it, or at least occupy my time with something equally as consuming. I play video games, board games, and go out with my wife and/or friends. I also spend a lot of my time working in some way on a Youtube series I host called Judge’s Corner. I probably have other hobbies I’m just not thinking of, but Magic really does consume a large portion of my life. Speaking of Judge’s Corner, tell us about your project. Alright, so I’m the host of a series produced by Gathering Magic and Cool Stuff Inc called Judge’s Corner. In each episode I go over different aspects of Magic rules or policies and explain those aspects as simply as possible to help viewers understand some of the basics and more advanced rules of the game. First let me say that this is not an official “judge project” per say. With that aside, I’m basically the brain and face of the series. I write the scripts, host the series, and answer comments or e-mail questions from viewers. Richard Castle (no, not the fictional character on “Castle”) is my editor. Producer? Manager? He does everything else, from filming, editing scripts to make them a bit more cohesive, editing and uploading the videos, and handling the majority of the technical side. We’re pretty much a two man team. Why did you decide to join Judge’s Corner? Richard approached me one day and pitched the series. I liked it, and while I was super nervous about putting films of me up on YouTube for the world to see, I’ve really taken a liking to it, and I can’t see myself quitting any time soon. Well, due to my nocturnal work schedule, I pretty much just wake up and go film in a lot of instances. That bad head is genuine. I also have been asked for my autograph once so far. That felt weird, but I obliged. Nothing too cool has happened yet. Bigger filming area. We literally film in a supply closet about 7 x 9 feet large, padded with foam. Well it’s given me a very interactive outlet to perform tasks as a judge without actually judging many events. I currently work every weekend, so I don’t get to attend as many events as I’d like. Judge’s Corner has kept me close to the Magic community at large without directly bringing us face to face. It has also helped me commit different aspects of the rules to memory. You remember things better when you have to teach them to someone else. How many viewers do you receive for each episode? So far some of the big topics have reached about 30,000 views in their one year life time, and others seem to be peaking at about 10,000. We’re getting about 5000 to 8000 in the first two weeks. How do you choose the topics for each episode? Episodes based on things current in Magic get priority, like set mechanic reviews, or individual cards that seem to be generating a lot of questions (here’s looking at you Soulfire Grand Master!). 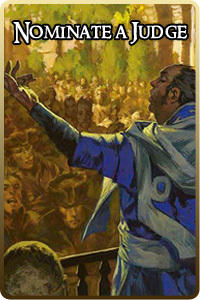 After that we hit topics that either seem to be asked a lot, or are fundamental to the rules of Magic. Sometimes we don’t address some of the big topics right away, or else we’d have nothing big to cover, and other times we don’t address them because I’m still trying to think of an eloquent way to write about them in a 5-10 minute episode (i.e. layers). Finally we cover minor topics that stick out to Richard or I, like keyword abilities, or basic mechanics of the game with a handful of advanced interactions and in-depth rules. Thank you for taking the time to talk to us about yourself and the Judge’s Corner project, David! We’ll see you all next week, judges, to feature another rock star on Judge of the Week! As usual, judges, don’t forget to keep sharing awesome judge stories round the world, nominate a judge TODAY!